The observations show that dark matter in the Universe is distributed as a network of gigantic dense (white) and empty (dark) regions, where the largest white regions are about the size of several Earth moons on the sky. You can hardly accuse Albert Einstein of being short on imagination. The man who invented General Relativity and helped invent quantum theory probably had more creative thoughts in an hour than most folks have in a year. But one of Einstein's more intriguing scientific papers, which appeared in Science in 1936, wasn't really his idea in the first place. It came instead from a Czech electrical engineer named Rudi Mandl, who was intrigued by one of relativity's implications. If massive objects bend light rays as relativity claims, Mandl asked, why couldn't a relatively nearby star act as a sort of cosmic lens, magnifying the image of a more distant one? That, after all, is how an ordinary glass lens works  bending incoming beams of light to sharpen, expand or otherwise manipulate what we see. Worn down by Mandl's relentless prodding, Einstein did the calculations and concluded that yes, stars indeed could operate that way  although he added that "there is no great chance of observing this phenomenon." He was quite right about the first part of his conclusion  and quite wrong about the second. It was in the 1970s that gravitational lensing was first observed and confirmed by scientists, and in that time it has become one of astronomy's most powerful tools. Two major announcements this week reinforce that fact. In the first, astronomers using the Canada-France-Hawaii Telescope, in Hawaii, released the largest map ever made of how dark matter is distributed through space. And in the second, a team using a network of smaller telescopes, presented evidence that the Milky Way is host to a minimum of 100 billion planets. Different as they are, both discoveries rely on the cosmic optical illusion Mandl proposed and Einstein described, but it may the dark-matter map that illustrates the power of that illusion most dramatically. Astronomers have been convinced since the early 1980's that the cosmos is filled with some mysterious, invisible substance that outweighs the stars and gas clouds we can see by a factor of about six to one. This dark matter is probably everywhere, but tends to be especially thick in clusters of galaxies. We know that because galaxies whirl around each other so fast that they'd fly off into space without the extra gravity dark matter provides. So much invisible matter in so defined a space ought to produce a lot of lensing  and it does, with galactic clusters in the foreground of a visual field dramatically distorting the images of galaxies in the background, not magnifying them so much as stretching them into elongated shapes. For just a single background galaxy, the elongation can be subtle, but when astronomers look at a lot of them together, the collective distortion can be revealing, providing a way to calculate backward to figure out what distribution of dark matter it took to produce the image in the first place. It's a little like looking at your own distorted face in a funhouse mirror and inferring what the mirror's shape must be. What the scientists found when they used this technique on background clusters was that dark matter is spread through the cosmos like an immense spider web, with clumps and filaments interspersed with largely empty expanses of space. It's not the first dark-matter map to show such a structure, but it spans more than a billion light-years, which makes it far larger than any of its predecessors. This does more than give us a macro look at the dark-matter landscape; it also helps strengthen a more-micro theory about just what the stuff is made of. 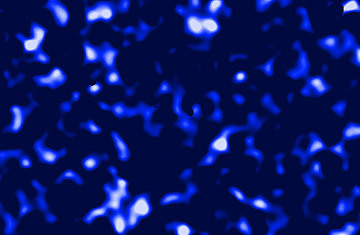 If dark matter is some sort of yet-undiscovered elementary particle, as astrophysicists believe, computer simulations suggest it should be distributed just this way. The other discovery, which appears in the current edition of Nature, is more in keeping with Einstein's original concept, with individual stars rather than vast galactic clusters serving as gravitational lenses. As Einstein explained it  and as later scientists confirmed  every so often, a distant star drifts just behind a relatively nearby one, causing the faint light of the background one to be magnified. If the nearby star has a planet in tow, that much smaller body can act as a little lens of its own, making the background star brighten too, albeit less dramatically. This so-called microlensing will occur either before or after the main lensing event, depending on whether the planet leads or trails its parent star. It's very rare for two stars to line up so precisely (that's why Einstein thought lensing would never be observed; he didn't count on powerful modern telescopes that can see very faint stars). It's even rarer for the foreground star to be orbited by a planet that is positioned just the right way to make the microlensing visible. For that reason, astronomers who search for these events have to watch millions of stars at a time. Even then, a half-decade's worth of watching by two separate groups picked up just three planets, according to the Nature paper. But when you factor in the odds against seeing anything at all, that turns out to be an impressively number  so large, in fact, that it suggests that every star in the galaxy, on average, has at least one planet. That's 100 billion planets, give or take. Even more significant, say the scientists, there are more small planets than big ones, which means the search for a twin of Earth is almost guaranteed to succeed. Einstein died long before gravitational lensing became such a powerful astronomical tool, so it's hard to know what he might say about it now. Back then, he was clearly a bit embarrassed about the whole thing. He wrote a private note to the editor of Science, thanking him, "for your cooperation with the little publication, which Mister Mandl squeezed out of me. It is of little value," the great man continued, "but makes the poor guy happy."